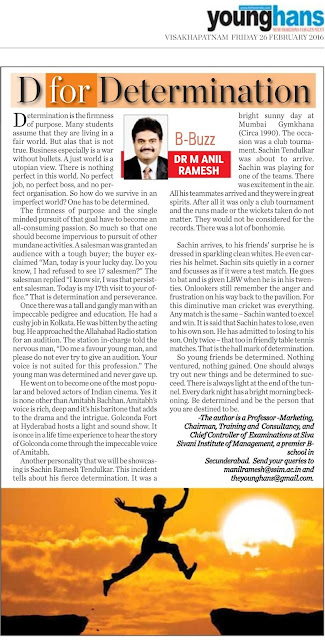 Dr.Anil - Marketing Musings: 26 ways to success - D for Determination - article published in The Hans India on 26th February 2016. 26 ways to success - D for Determination - article published in The Hans India on 26th February 2016. Determination is the firmness of purpose. Many Students assume that they are living in a just and a fair world. But alas that is not true. Business especially is a war without bullets. A just world is a utopian view. There is nothing perfect in this world. No perfect job, no perfect boss, no perfect organization, and no perfect wife/husband and so on. So how do we survive in an imperfect world? One has to be determined. The firmness of purpose and the single minded pursuit of that goal have to become an all-consuming passion. So much so that one should become impervious to pursuit of other mundane activities. A sales man was granted an audience with a tough buyer. The buyer exclaimed “Man, today is your lucky day. Do you know, I had refused to see 17 salesmen?” The sales man replied “I know sir, I was that persistent salesman. Today is my 17th visit to your office”. That is determination and perseverance. Once there was a tall and gangly man with an impeccable pedigree and education. He had a cushy job in Kolkata. He was bitten by the acting bug. He approached the Allahabad Radio station for an audition. The station in-charge told the nervous man “Do me a favor young man, please do not EVER try to give an audition. Your voice not suited for the radio”. The young man never gave up. He went on to become one of the most popular and beloved actors of Indian cinema. Yes it is none other than Amitabh Bachhan. Amitabh’s voice is rich, deep and it’s his baritone that adds to the drama and the intrigue. Listen to the opening voice over of the movies of Lagaan. The voice sets pace for the iconic movie. Golconda fort at Hyderabad hosts a light and sound show. It is once in a life time experience to hear the story of Golconda come through the impeccable voice of Amitabh. A slightly built young man had travelled in second class from Delhi to Mumbai with very little money but with a heart filled with determination and hope to make it big in Bollywood. He exhausted all his money and sat despondently in the Juhu Beach. He bought a small, packet of peanuts. He was munching them and looked on at the Juhu bungalows. He told himself “The first bungalow is not good, so are the 2nd and the 3rd bungalows, oh yes the 4th one is the one that I would be owning in the future”. Just ponder at the audacity of this man. Nothing in his pocket but filled with determination and hope. This young man made it in Bollywood inspite of all odds, no great looks, no bollywood connections and not very great roles either initially. And yes he did buy the fourth bungalow and named it Mannat (gift of the god). The person that we are referring to is Shah Rukh Khan the badshah of Bollywood. The Third person that we will be showcasing is Sachin Ramesh Tendulkar. This incident tells about his fierce determination. It was a bright sunny day at Mumbai Gymkhana (Circa 1990). The occasion was a club tournament. Sachin Tendulkar was about to arrive. Sachin was playing for one of the teams. There was excitement in the air. All his team mates arrived and they were in great spirits. They came to party. After all it was only a club tournament and the runs made or the wickets taken do not matter. They would not be considered for the records. There was lot of bonhomie and leg pulling. Sachin arrives. To his friends surprise he is dressed in sparkling clean whites. He even carries his India helmet. Sachin sits quietly in a corner and focuses as if it were a test match. He goes in to bat and is given LBW when he is in his twenties. Onlookers still remember the anger and frustration on his long way back to the pavilion. For this diminutive man cricket was everything. 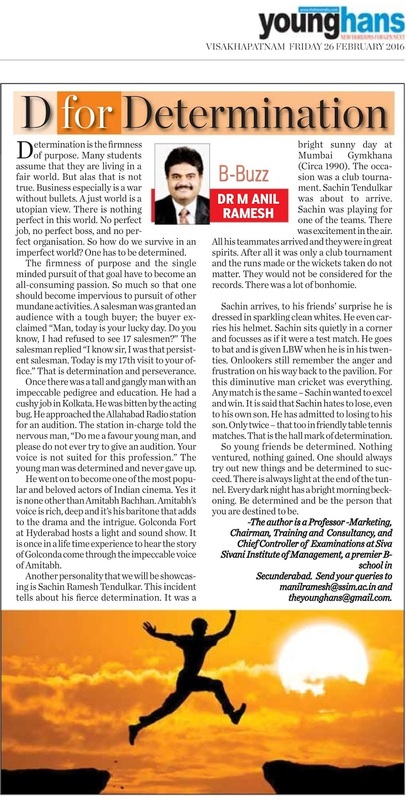 Any match is the same – Sachin wanted to excel and win. It is said that Sachin hates to lose, even to his own son. He has admitted to losing to his son. Only twice – that too in friendly table tennis matches. That is the hall mark of determination. So young friends be determined. Nothing ventured, nothing gained. One should always try out new things and be determined to succeed. There is always light at the end of the tunnel. Every dark night has a bright morning beckoning. Be determined and be the person that you are destined to be.